Emirates Steel, the largest steel producer in the UAE, has refinanced $650 million of debt with a new loan and sukuk or Islamic bond, Reuters reported. The company owned by Abu Dhabi’s Senaat, a state-owned investor in the emirate’s industrial sector, raised $1.3 billion in credit facilities in 2014, due in 2022. It hired BNP Paribas to coordinate a $400 million sharia-compliant loan financing in September. The significant loan refinancing deal will enable the company to accelerate deleveraging, increase financial flexibility, simplify its debt structure and fund its growth plans, said the report. Meanwhile, it signed a strategic agreement with Abu Dhabi Marine Services (Safeen), a subsidiary of Abu Dhabi Ports, which has been valued at Dh1 billion. The agreement was signed by the chief executive officer of Emirates Steel, Eng Saeed Ghumran Al Remeithi, and Captain Mohamed Juma Al Shamisi, chief executive officer of Abu Dhabi Ports, in the presence of Captain Adil Banihammad, Acting CEO – Marine Services, Abu Dhabi Marine Services – Safeen, and a number of senior officials and engineers from both parties. The agreement, which will be implemented in January 2021 and will extend over the following ten years, is the result of Emirates Steel’s commitment to both providing high quality products, and optimising its supply chain in accordance with international standards. Such aims fall in line with Emirates Steel’s efforts to support Abu Dhabi Economic Vision 2030, the company said in a release. Emirates Steel is owned by Senaat, the UAE’s largest industrial conglomerate and a driving force for implementing the Abu Dhabi government’s industrial diversification policy. Strategically located in the Industrial City of Abu Dhabi, some 35 km away from the heart of the city of Abu Dhabi, Emirates Steel is the only integrated steel plant in the UAE, utilising the latest rolling mill technology to produce rebar, wire rod and heavy sections. 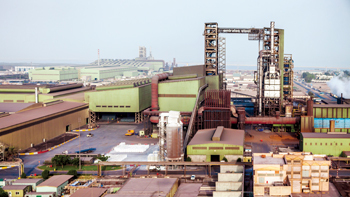 Established in 1998, Emirates Steel grew in a relatively short period of time from a simple re-roller of imported steel billets to a complex integrated manufacturing plant, using modern solutions to tackle traditional industrial problems to generate value for its various stakeholders. In 2012, the company began producing at a capacity of 3.5 million metric tonnes per annum (mtpa), following two expansions and the investment of around Dh11 billion ($3 billion). Earlier, the only integrated steel plant in the UAE shared insights on steel market trends at the 22nd Middle East Iron and Steel Conference (MEIS) which was held in Dubai. During the event, the Emirati group showcased its unique product range, which is accredited by the American Society of Mechanical Engineers as nuclear grade steel. The company’s pavilion at the conference allowed participants to see the range and quality of its products, designed to meet the highest international standards of quality. Eng Al Remeithi participated in the keynote executive panel, titled ‘Learning from the down cycle to profit in 2019’, which focussed on the short and long-term future of the iron and steel industries. 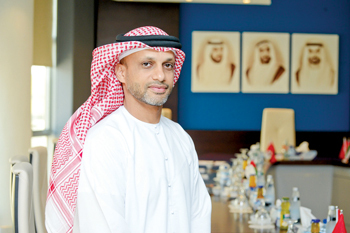 As the CEO of one of the Middle East’s leading steel producers, Al Remeithi offered his unique insights into the sector and its current status. “I’m pleased that Emirates Steel was a Platinum Sponsor of this event, highlighting our continued role in supporting the industry as a whole and ensuring that we lead the globe in the quality and innovation which this region produce,” stated Al Remeithi. Earlier, it signed a four-year (2018-2021) high-value contract with Brazil-based Vale, a leading producer of iron ore and pellets, to supply iron ore pellets for its steel plant in Abu Dhabi. Emirates Steel and Vale have a long-standing business relationship that commenced in 2007 and has through this four-year contract strengthened into a strategic partnership. Emirates Steel has an iron ore pellet requirement of around 6 million tonnes per year, said a statement. The agreement was signed by Eng Al Remeithi and Peter Poppinga, executive director, Vale during an official meeting held at the Emirates Steel office in the presence of senior officials from both companies, it said. “This new partnership plays a vital role to further strengthening the growth of our steel production in Abu Dhabi, as well as realising our vision of being a world class steel manufacturer providing the highest quality products, services and solutions to our customers and maximising returns to our shareholders,” he said.